A global day of action on April 29 involved protests in several cities to call on the Indonesian government to allow free and open access into occupied West Papua for international journalists, humanitarian agencies and human rights groups. Melbourne rally co-organiser said Matt Gale said: “West Papua is one of the world’s most isolated conflict spots. For decades, indigenous activists campaigning for their rights have been arrested, disappeared, tortured and killed. More than 200 people attended a public forum called "Resistance Rising: A Panel of First Nations Leaders" at the Brunswick Town Hall in Melbourne on April 18. The forum was jointly sponsored by Warriors of the Aboriginal Resistance and the Indigenous Social Justice Association. Co-founder of Warriors of the Aboriginal Resistance Meriki Onus told the audience: "The system is constantly knocking at our door. The system destroys us or takes our children." Adelaide. Photo: Welcome to Australia via Facebook. About 2000 people joined a rally against racism in Federation Square on April 4. The Melbourne rally was the largest counter-mobilisation against the racist, “Reclaim Australia” protests organised across Australia. The Melbourne “Reclaim Australia” event was attended by about 500 people. Up to 15,000 people joined the Palm Sunday Walk for Refugees in Melbourne on March 29, more than double the numbers from last year refugee advocates said. 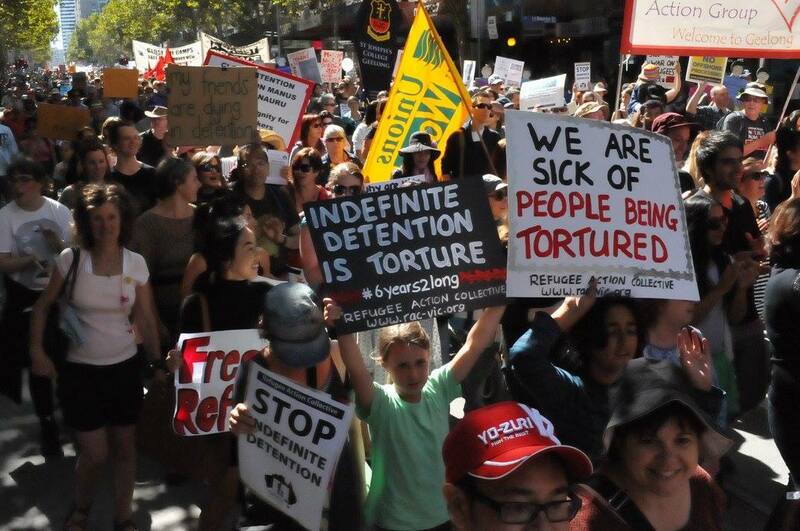 Large rallies and marches were also held in 12 other Australian cities, and 19 cities overseas, demanding refugees be released from detention. About 300 people in detention on Nauru also joined the protest and called for an end to offshore detention centres.